HAIFA, Israel — Elbit Systems, the Israeli firm whose Helmet Mounted System (HMS) is used on helicopters and fighters worldwide, including the new F-35, is debuting a similar sensor-fused system that allows tank commanders to essentially see through the walls of their armored vehicles. 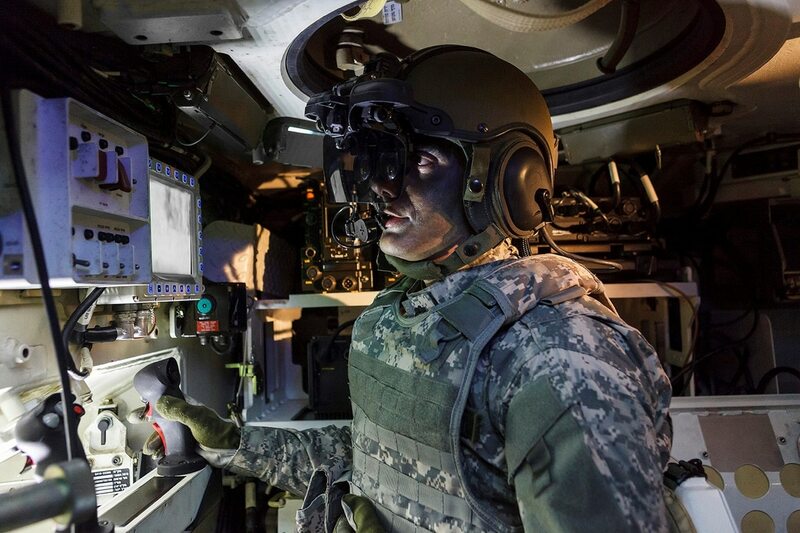 Called IronVision, the vehicle-adapted HMS provides "protective glass walls" for tank or armored fighting vehicle crews who may need to operate in so-called closed-hatch mode when maneuvering in high-threat areas, according to Boaz Cohen, director of Elbit's land systems division. "Ground warfare has changed dramatically in the past 15-20 years from open areas to closed, complex urban terrain. We believe IronVision will change the way ground maneuvering forces fight in this new environment," Cohen told Defense News. In an interview at Elbit headquarters, Cohen said the helmet system, which the firm adapted from technologies developed for airborne platforms, lets wearers "see through" the armor of their vehicle to locate, identify, track and engage enemy forces and threats. "When forces are protected, they don't need to apply as much fire. This is critically important in urban warfare, when you don't want to fire all over the area and kill uninvolved civilians," he said. Elbit plans to demonstrate the system at next week's Eurosatory exhibition in Paris. According to the Elbit executive, IronVision displays 360-degree, high-resolution imagery from data collected from digital sources in and around the vehicle. Imagery is projected in full color to the wearer's visor and is of a fidelity high enough to track individual commandos crawling within meters to enemy vehicles travelling up to 300 meters away. Cohen acknowledged that it could take time for prospective users to adapt to the concept of closed-hatch operations, especially when forces have been trained for decades that leadership and full situational awareness demands a commander's head outside the tank. "I agree that it's preferable to have your head outside. In peacekeeping operations, you want to show presence. But when you get into a high-threat situation, the question becomes: Can you have your head outside and survive? The minute a sniper hits a tank commander, everybody dives in," Cohen said.